As you may already know, getting a submission of yours published is one of the best ways to break into either a new niche or kick-start your freelancing career altogether. 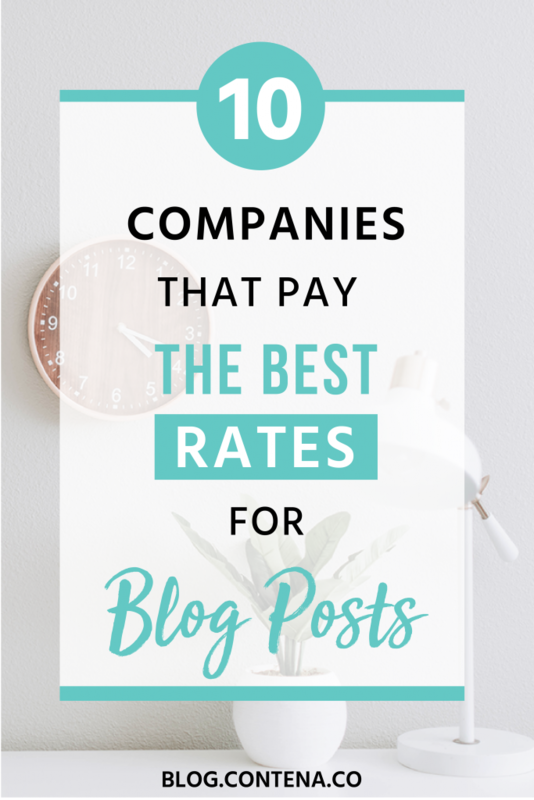 However, these gigs are even better if you find companies who are willing to pay for your content; which is why we’ve compiled a list of websites who spend good money on their bloggers. Before we head into the meat and potatoes of this post, take note of the below advice, Trust us, this massively increases the likelihood of having your submission accepted. This may sound obvious, but you won’t believe the number of writers who don’t abide by the guidelines. Often blogs accepting submissions have a long list of requirements you’ll need to adhere to. Whether this be following a style guide, or pitching an idea before sending the full article- you need to find out what they want. If you’re required to send an email as part of your pitch, or a cover letter for your submission, be sure to personalize the message. Take time to find their name using their website, LinkedIn profile, or a Google search; do whatever you need to do to source this info. It’s bound to be out there, and it’ll undoubtedly help you stand out from the crowd! If you’re interested in business, then you’ve probably come across Entrepreneur. It’s an authoritative business magazine that’s renown across the globe, so scoring a guest blogging gig with them would be a dream. They allow a byline with links to your site, which undoubtedly puts your name on the map and helps to secure your place as an industry authority. The best thing about this gig (besides the recognition) is the pay of a whopping $1 per word! To register your interest, you can fill out an application here. If you can whip up a good-quality tutorial for office workers, then a submission for quill.com sounds like the perfect task for you! All you need to do is think about a few office issues and break down a solution in a way that’s both simple and engaging. Solution Specialist: 300-500 words ($50) compiling simple guides on how to resolve typical office concerns. Tutorial Technician: 500-1000 words ($100) tackling problems that need more depth. How-to Hero: 1000+ words ($150) handling complicated issues and providing more than one solution. To submit a potential topic to quill.com click here. If you want to break into the health and wellness niche, then a submission to ACHS is a great starting point. Just craft a unique article on your favorite fitness and wellness topic, and see what happens. ACHS pays $50 for 600 words; which is pretty good going! For more info on how to submit a guest post, click here. For those of you familiar with interviewing and conducting thorough research, this is the perfect opportunity for you. Our Homes accept guest posts demonstrating a sound knowledge of home building and decoration. People: a 700-word piece, featuring artisans or craftspeople creating practical home goods. Feature Home: a 900-word feature on a beautiful home, providing details about locally sourced materials and finishing. Feature Home and Builder: a 900-word article featuring a high-quality home constructed by a local builder. You should also include details on local materials and furnishings. You’ll be compensated an impressive $0.40 r.p.w for your efforts. Click here for more info! We love ‘Bless This List’ which accepts submissions in the form of original lists; they’re great fun! Plus, you’ll receive $0.07 r.p.w. Click here for details on how to submit your piece. Then, you should consider sending ‘Credit Advice Writers’ a submission. Or, if you’re familiar with topics of a similar nature, get in contact. All posts should be over 600 words, and you’ll be rewarded with $0.17 r.p.w. Check out their guidelines here! Do you pride yourself on having a unique take on ideas such as: earning, saving, or investing money, etc.? If so, this could be a fabulous gig for you. Articles should be at least 700 words long, and you’ll earn $0.21 r.p.w; which is not to be smirked at! Click here for more details on how to get the ball rolling. This publication is dedicated to ‘Living Better…for Less.’ The aim of your content should be providing readers with ways to save both time and money. The Dollar Stretcher pays writers $50 for 500 words. For more info on how to submit successful submission, click here. If you’re a technical writer and can craft helpful tutorials about Linux, Linode or cloud infrastructure, then you should try sending a submission. Linode pays their writers as much as $200 for 500 words! Sending a submission to FlyWheel is a fabulous idea if you’re a WordPress geek. If you’d like to write for them, click here for more info. Do you consider yourself a Meteor developer, and love writing about all things tech? If so, you should contribute to the Meteor Chef. They’ll pay you $100 for 500 words! For more information on how to send a contribution, click here. Your time is valuable, no matter what stage you’re at in your freelancing business; which is why building a portfolio using companies who recognize and pay for your hard work is the way to go. We hope this feature not only helps you successfully pitch your ideas, but also encourages you to find other blogs, websites, and companies who’ll compensate you for your fabulous content!